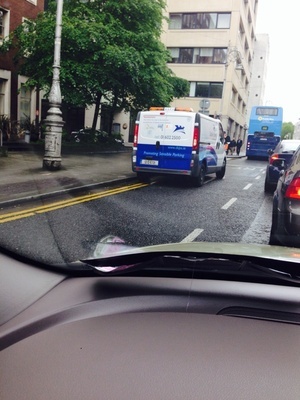 Pearse Street Garda Station, Dublin this afternoon. Posted in Misc and tagged Classic Parking at 3:54 pm on September 9, 2014 by Aaron McAllorum. Unless things have changed the cars are often left unlocked (but with no keys) or locked but with the handbrake off. You can then easily roll them out of the way. Saw this a few times over the years. Couldn’t believe it when I first saw it. Me either, I was standing at a bus stop nearby and noticed someone playing tetris with the cars, funny to see. They usual way, by pushing the other cars out of the way. None of the cars have their handbrakes on there. Easy ….sure he’ll just roll one of the other cars since they all sit there with their handbrakes off. Yeah, as the guys said, they just push the cars around, has been like that outside Pearse Street station since the invention of the motor car. Mostly used as a community Garda vehicle regardless. 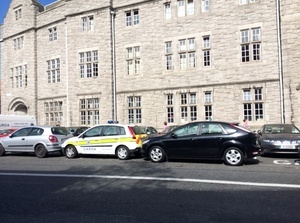 Respond and Garda vehicle aren’t compatible either. It’s been this way since before most of you were born. It’s was like this before the wheel was invented, they had awful problems doing it back then! I believe they push the other cars out of the way. That is one of the few specialist Garda VTOV’s* to respond to serious crimes like tv licence evasion and other evil. If you stood still for long enough they would park on your head down there.